Your child’s masterpiece, photo’s from back in the days or special notes are just a few things who are worth to hang at your wall. With my tips and tricks you can design your own magnetic calendar or, for the ones who like to create something huge, a full magnet wall! 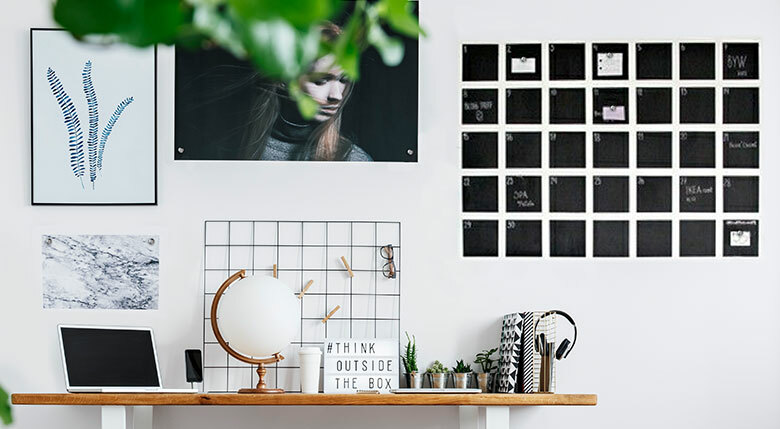 MagPaint’s MagnetPaint is perfect to create this magnetic calendar super easily. Because the paint contains tiny iron particles the paint becomes magnetic and magnets can stick to the wall. MagnetPaint is a dark grey colored paint which is best to apply in at least three layers for optimal strength. Do you have some paint left? Use it for extra magnetic strength. For the fourth and last/top layer you can choose any color you like. For example; combine it with MagPaint’s BlackboardPaint. Now you can practice and show your handlettering skills in combination with a magnetic wall! Apply layer by layer with a roller, and make sure you apply three layers of MagnetPaint. To finish it you can paint it over with a layer of MagPaint’s BlackboardPaint, now you have your own magnetic chalkboard calendar. Once the paint is dry and you are satisfied, you can remove the tape and stick it with notes or messages! It’s a creative way to give your workspace a restyling or extra touch. Easy to make, lovely to watch and use! Enjoy!